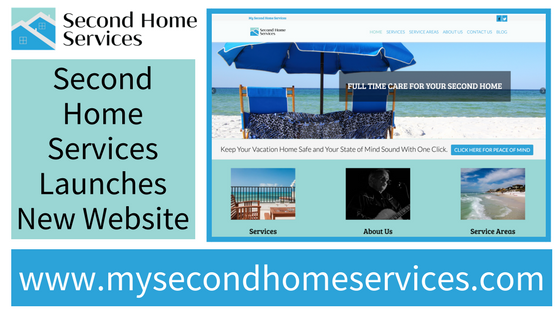 This month, Florida coastal company, Second Home Services, has launched a new website to better serve its 30A and surrounding clients who are absentee homeowners. The new website offers resources for 30A residents with vacation homes in the area in addition to general 30A beach information for vacationers. It also sports a new “Contact Us” page for those specifically requiring vacation home watch services while their luxury home is unoccupied. Second Home Services has proudly served various communities within 30A, Miramar Beach and Destin, Florida with vacation home watch services for over 20 years. Co-owned and operated by Duke Bardwell a longtime fellow resident and local musician, Duke, and his family understand what maintaining a second home on, or near the beach entails and holds themselves to the highest standard. “We felt it was time to invest in a website that would become a resource for an absentee homeowner with vacation and second homes in the area. The site must provide a great user experience for families and executives working from desktops, laptops or a smartphone.” stated co-owner Rebecca Bardwell. Checking doors and windows, kitchen utilities, weather damage checks, water heater and AC filter/unit checks, thermostat changes, flushing toilets, etc. Additional home check services include: receiving deliveries, forwarding items, response to alarm calls, key services for other service providers, acquiring estimates for repairs, monitor work of other service providers, providing digital photos of problems or repair work, storm preparation including moving outdoor furniture, etc. Second Home Services specializes in providing each homeowner with customized plans specific to the property and owner’s needs. To enjoy the new website, visit www.mysecondhomeservices.com or fill out a contact form for a free consultation or services quote. Second Home Services, is a home watch company owned by longtime local Duke Bardwell, that services non-rental vacation homes in Destin, Miramar Beach and along 30A. Operating out of Santa Rosa Beach, FL, Second Home Services has been a member of the local 30A business community for over 20 years. For more information visit www.mysecondhomeservices.com or contact Duke directly at (850) 865-4189.